Sunday was a beautiful sunny day in Northern California. It was a perfect day to hold a barbeque competition. 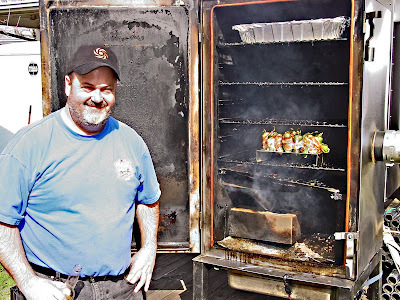 The California Barbeque Association held a warm-up event in Placerville, California. Placerville (Hangtown) is located in the foothills of the Sierra Nevada. Hangtown originally was a base camp that supplied the Gold Miners with necessities and materials for mining. Placerville was called Hangtown because of the swift dispatch of three Desperados in a large Oak tree downtown. Today, the competition will be held at the fair grounds. The contest started Friday evening with a potluck. Forty six teams were present Saturday afternoon to turn in chicken and pork ribs. Ms. Goofy and I arrived Sunday to judge the turn in of brisket and pork. We have brought our judging uniforms and large appetites. 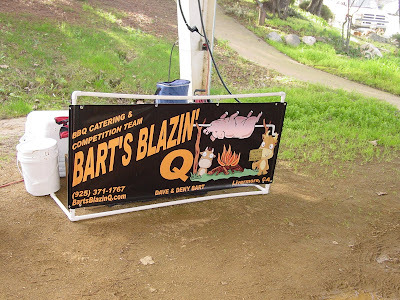 This event was an informal competition for the California BBQ Association. This contest was a tune-up for later barbeque events. In normal competition, the judging is blind. This means the judges do not know whose meat they taste and the competitors do not witness the actual judging. 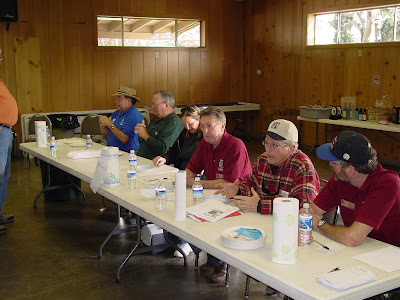 The judges table was turned around and bbq teams watched us sample their entries. The meat would be scored and then we gave a critique and explanation for the marks we gave. The barbeque teams would learn what, we, the judges were looking for. We judged for three criteria: Presentation, Taste, and Texture. This was a great learning experience for all involved. We had a wonderful time at this gathering of barbeque enthusiasts. 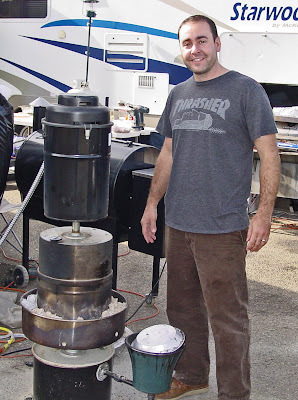 I always get a kick out of checking out all of the different barbeque rigs. There was everything from ‘Weber Bullets’ to fancy custom rigs. There were a lot of humorous BBQ team names. This was one of my favorites. It struck my funny bone. The overall winner of the competition was the Team of “Bart’s Blazin Q”. I think everybody took away some new knowledge and experience from this event. The “1st Annual Hangtown Winter fest” was a success and got everybody excited about the BBQ season to come. I took home a ‘Meat baby”! Wow, that's a lot of teams - how do you begin to even taste that much and how do you keep them all straight? Normaly the judging takes place in one day. With all these teams it was split into two days. There were aprox 28 judges. The turn-ins were time staggered and the judges worked everyother session. You usually only take one bite of each entry. It still is a lot of food. I did take home a 'Meat Baby". The scoring is entered into a computer. And you thought being a Barbeque Judge was easy! Great post. I'm going to have to watch for contests here in Denver. I'd love to attend just to learn more. Were you a judge? Sounds like a lot of fun. Judging is great, but personally I prefer competing and I do when the fiances allow. A statement you made puzzles me - "The barbeque teams would learn what, we, the judges were looking for. We judged for three criteria: Presentation, Taste, and Texture." 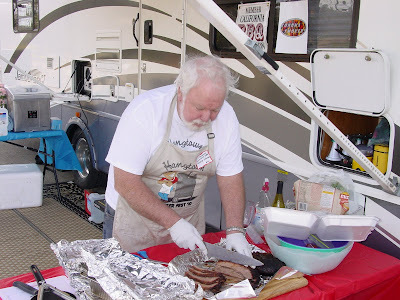 Were you not judging using KCBS rules? 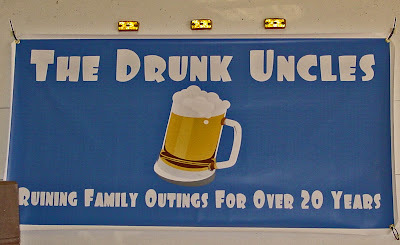 It was a excellent competition warm-up, I like the Drunk Uncle's banner too. 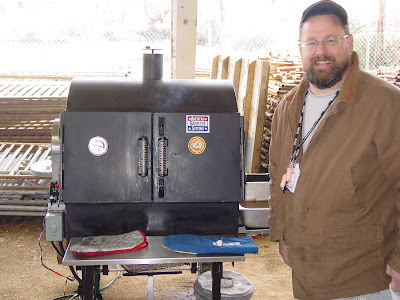 The judging was done in the open in accordance with the KCBS rules, except for the fact that the teams were allowed to be present and get the feedback from the judges after they marked their scores. Invaluable for the many first time teams there. A Year On The Grill, Someday, I would like to enter. We are planning to do a small contest this summer. Highlandsranchfoodie, Yes Ms. Goofy and I judged up a storm. WhiteTrashBBQ, Yes and No. We judged on a Presentation, Taste, and Texture on a 9 point system. But we judged right in front of the barbeque teams. We verbally gave our scores and why. Bob, Thanks that is what I meant to say. We had a blast. Ah but "presentation" is not a KCBS category - "appearance" is. In KCBS you are to only judge the appearance of the meat - not the garnish, not the layout in the box. You're only supposed to look at the meat. Dang, even got yerself a flickr action too! WhiteTrashBBQ, Yes, You are so right. Thankyou for the correction. How cool. They should be paying you. But... you got a Meat Baby. What is a Meat Baby? I have enjoyed reading about this event here and on Bob's blog. Sounds like you both had a weekend that makes the rest of us jealous! Reverend, Leave the mold behind and celebrate with me. We will eat bacon and sing Kumbaya! Cookiecrumb, Meat Baby? It is a sophomoric term for meaning your stomach is so stretched out that you look like your having a baby. I heard that Johnny Weir, Olympic Ice dancer may try to actually have a Meat Baby? Where can I get a costume like his? I am off track back to the comments. Sorry! Chris, Put yourself on a boat, plane or ice skates and attend a BBQ event. Too much fun! YUM! I would love to be a judge for one of these competitions.. I wouldn't be able to stop eating. I think my stomach growled a few times just looking at the pictures. I love me some barbecue.